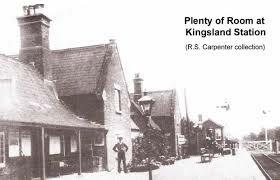 This page has been edited by Gordon Roberts who used was born and brought up in Kingsland. He has put down on this page many of his memories of the old railway which used to run through, and stop at, Kingsland prior to Beeching. We hope you find it interesting and he would very much welcome comments and contributions based on your memories. The web committee thank him for his kind contributions to this web. Please click here to send us your comments or use the form under Contact Us. Memories will be put on this website to share with others. An offer of information from Ken Williams, owner of Railway Cottage. I am the present owner of Railway Cottage , previously Station Cottage, since February 1987 when I moved from Leominster. I have copies of all the original deeds from the then Leominster and Kington Railway Company . The information is quite comprehensive and I’m sure would be of interest to any railway enthusiast or those who have written books about railway history. The information I have also lists the previous owners dated back from the original sale and letters and notes from some of the owners along with some copies of wills. If anyone is interested they can contact me by e mail or phone . My e mail is ken.railway@hotmail.com or phone on 01568 708915 my answer phone is always on so please leave a message and I will be in contact. A railway memory from Roger Thomas – many thanks for sending it in! Mrs Knill was my step Grandmother, my Grandad William Knill passed away in 1955. I remember sitting outside the crossing as a little lad in the fifties eating jelly. Sarah Knill had been married before (Preece), and married again in the sixties. 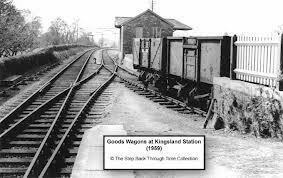 The single track railway from Leominster to Kington opened on 28th July 1857. 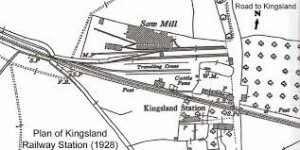 Kingsland was one of three intermediate stations, the others being Pembridge and Titley. Later on, the line was extended to New Radnor, and branches were built from Titley to Presteigne and also to Eardisley. The picture shown here was taken in 1959, four years after the end of passenger services and looks north towards Kington, The track on the right served the station shed (which can be seen in the background), the coal siding with the two wagons and the cattle pen which is hidden behind the wagons. In earlier years, this track would have looked much busier but, by 1959, road hauliers had taken most of the freight traffic away from the railways and even the irregular goods train ceased in 1964. The station buildings behind the photographer are now private homes and the platform was of a generous size (see photo). There was a large goods yard which is now used for commercial purposes. The wagons shown in the picture brought coal for the Old Radnor Trading Company, located at the entrance to the yard, where Mr Edwin (Ted) Passey was Manager. He lived at Lugg Bridge and died at the wonderful age of 102 years . There is still a coal business at the station today. The site of the railway station is quite clear to see today on the A4110 next to Border Oak and the sawmills. The station was built to generous proportions as can be seen in the excellent plan shown below. The large goods yard had three tracks and there was a siding into the sawmills with a typical white railway gate barring the way. The station platform was spacious and designed for a large crowd which probably happened only occasionally. In 1933 passenger tickets issued totalled 4,316 compared to no less than 16,394 in 1903 which indicates how other forms of transport such as private cars and buses had developed. 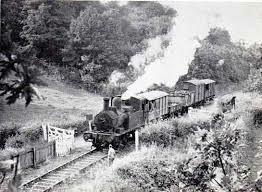 The steam engines working the line were mainly small panniers from the sheds at Leominster or Kington. In 1949, there were five passenger trains in each direction and a daily freight train. In addition to the level crossing at the station, there were also level crossings at The Brook and near Waterloo Mill where Mrs Knill was the gatekeeper for many years. The gatekeepers’ cottages are now private residences. The railway was poorly patronised in the 1940′s and 1950′s because buses operated by Primrose Motors, Yeomans ( later) Radnorshire Motors and Midland Red were reliable, frequent, and so much cheaper. The station was closed for passengers on 7th February 1955 and for freight on 28th September 1964. Some effort was made to sell the line as a going concern, and bit was offered for sale at the bargain price of £89,000 ! 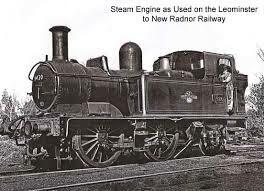 As Steam enthusiasts were not so common then, no buyers came forward and an opportunity was lost. The tracks were eventually torn up and sold for scrap, the land reverted to its former use, and the stations were sold to people who converted them into houses. The stations at Kingsland (as well as Pembridge & Fencote) are good examples. Please see some more Railway photos in our Photo Gallery. Again, if you, your parents or friends have any memories which you would like to share with us and other viewers of this web, please contact us via this link. We will put your contributions below. Very many thanks. 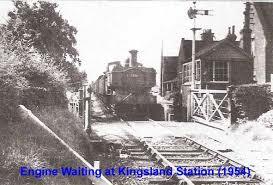 Although not Kingsland history exactly, we have been informed that Titley Junction was quite a busy station with the “main line to Kington and Leominster and the branch lines to Presteigne and Eardisley resulting in about thirty train movements each day”. One of the eminent signalmen at Titley was Jack Sankey, the father of the equally eminent Arthur Sankey a much loved, popular and respected resident of Kingsland who became a top main line driver of steam trains. Webmaster. 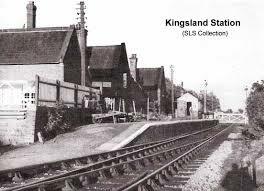 I am 82 and have lots of fond memories of Kingsland and the Kington Branch. 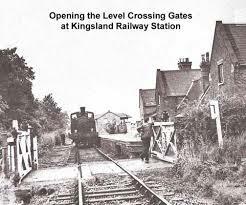 I served at Kingsland Station in 1948 under Mr Savory the Station Master as a Porter and worked with Fred Postons, Tom Evans, Harry Williams, whose daughter worked at the Sawmills, and was it Freddy Mills? My Gran kept Bullocks Mill Crossing. I began working on the railway (GWR) at Kington in 1947, before going down to Kingsland, then later to Leominster engine sheds before becoming a fireman at Leominster and later at Hereford. 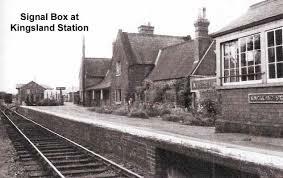 I remember hand pumping water each day into a roof tank above the station master’s (Mr Savory) house, weighing fruit brought in by small holders, loading it into rail vans, and regularly unloading trucks of fertilizer, lime, basic slag and other such exotic stuff. Opening and closing the road gates for Tom or Harry was an occasional treat. I have recently written and published a book about my schooldayswhen I lived at Titley. Titley Station, Kington Museum, and Kington bookshop have had copies. The owners of Bullocks Mill crossing cottage (my Grans home) are still my friends. I knew Arthur Sankey very well indeed, and also his Father, Jack. I am delighted that Kingsland station will not be forgotten. When I sometimes drive by I look longingly up the line and recall many happy days and events, like cows or sheep on the line, and a few practical jokes we played. Robert (Bob) Jenkins ; Worcester. I was very interested in the railway reminiscences as I have just finished reading Sue Gee’s novel ‘The Mysteries of Glass’ which is set in 1860 and begins with a man travelling the line from Leominster through Kingsland and Pembridge and alighting the train at the Bullocks Mill crossing beyond Titley. Webmaster: Bullocks Mill is not shown on the route map above. However, it did exist as this photo shows. Your webmaster was chatting to his friend Mona who, many years ago, came from a farm in Lucton. She clearly remembers using the Kingsland line some 70 years ago when her father would take her in a Pony and Trap to Kingsland station. There, as a young girl, she would be locked in a carriage for the journey all the way to New Radnor where her Uncle would get the carriage door unlocked for her to be taken on to her grandparents farm. She can also remember her family using the railway for delivering the farm’s cranberries to the wholesaler. 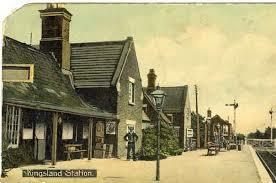 My Great-Grandfather John Leworthy was the Station Master at Kingsland in the early 1900′s. I hope these photographs may be of interest to you. What an unusual photograph for Kingsland Station. 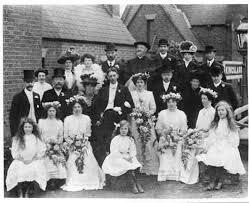 Who was getting married ?